Against the Modern World is the first history of Traditionalism, an influential yet surprisingly little-known twentieth century anti-modernist movement. Involving a number of important, yet often secret, religious groups in the West and Islamic world, it affected mainstream and radical politics in Europe and religious studies in the United States… It found its voice in René Guénon, a French writer who rejected modernity as a dark age, and sought to reconstruct the Perennial Philosophy—the central religious truths behind all the major world religions—largely on the basis of his reading of Hindu religious texts. Mark Sedgwick reveals how this pervasive intellectual movement helped shape major events in twentieth century religious life, politics and scholarship—all the while remaining invisible to outsiders. The author created advertising story lines for the book that are overly sensationalized, thus distorting the facts. The author has an undisclosed personal history with Traditionalism that may have created a bias in his point of view. Several of the author’s generalizations and unilateral assertions about Islam demonstrate a narrow and intolerant interpretation that is characteristic of fundamentalist Islamic movements. The author coins terms without adequately defining what he means by them, while ignoring established definitions. The author makes connections between people, ideas and events that are superficial, misleading and contrary to existing scholarship. The author inappropriately stretches the definition of a Traditionalist in unprecedented and inappropriate ways, while inaccurately narrowing the current understanding of Traditionalist philosophy. The author’s research ignores existing scholarship that is contrary to his conclusions, and his methods encourage unsubstantiated allegations from informants who appear to harbor hostility toward Traditionalism. This was the author’s comment to me after I had observed that the advertising story lines for his book—posted on his Internet site—were overly sensationalized and thus distorted some important facts. But first, some background about my interaction with the author: I contacted Dr. Sedgwick in January 2003, after the promotional descriptions and summaries for this book3 were brought to my attention. I concluded that the manuscript for Against the Modern World likely contained significant errors, and therefore wished to provide Dr. Sedgwick with additional information so that he could at least make a more balanced presentation of certain issues. After a series of correspondence, Dr. Sedgwick granted the request for me and two other Traditionalist authors to read and comment upon three chapters of Against the Modern World. The review process provided various insights into Dr. Sedgwick’s research methods, scholarship and motivations, including his admission recorded above. [The first recollection] has summed up the meeting… vividly and accurately… I think Sedgwick was disappointed with [Dr. Lings’] remark that one must love one’s Shaykh; not because he necessarily thought it untrue, but because he may have feared that he was temperamentally unsuited to following a spiritual path. My recollection of further discussions with him, until I lost touch with him around 1993, was that he badly wanted to find a spiritual path but felt unable to follow one. I gained the impression, but this is only an impression, that this caused him some sadness and engendered some bitterness in his approach. In various ways Dr. Sedgwick’s analysis demonstrates the kind of zeal seen in recent converts to Islam, who often adopt some of the narrow and intolerant interpretations that are consistent with various fundamentalist Islamic groups. For example, Dr. Sedgwick spends parts of three chapters exploring whether it is permissible for a Sufi Shaykh to grant various dispensations to disciples living in the Western world so that they are not obliged to follow all of the requirements of Islamic formality while living in a non-Islamic culture. In his discussion he fails to mention that the four schools of Islamic jurisprudence disagree on many interpretations of required formalities, and that there is a significant ongoing debate among Muslims living in the West on exactly this issue. The author repeatedly asserts that it is almost never permissible to omit any formality of the religion. To justify this opinion he then presents what he says is “the well-known story of the shaykh traveling through the desert with his exhausted followers during Ramadan [the month of fasting]. Suddenly, an oasis with a cool, clear pool and date-palms laden with ripe dates appears from nowhere. ‘Help yourselves!’ says the voice of God…” But the Shaykh recognizes that this is in reality the voice of Satan “‘because I know that God never releases anybody from observing the Sharia [Islamic law]’.”8 During this ongoing discussion he repeatedly disparages the practice of the dhikr—remembrance of God (“prayer of the heart”) as part of a spiritual method.9 These and many of Dr. Sedgwick’s other opinions, all of which are presented as based on some single absolute Islamic authority, ignore numerous Koranic injunctions, ahadith,Islamic jurisprudence and the commentary of Sufis throughout history to the contrary.10 And if Dr. Sedgwick is correct that it is never permissible to omit any formality of Islam, including during Ramadan, then a discernable percentage of the world’s Muslims, especially those Muslims working in the West, are necessarily excluded from ever attaining the degree of orthodoxy that Dr. Sedgwick seems to hold as an absolute standard. To speak categorically in the name of Islam on such matters demonstrates a presumption that may in part be explained not only by his recent conversion to Islam, but also by his failed attempts to follow a Sufi spiritual path. The book states, “The Traditionalist movement has no formal structure, and since the late 1940s has had no central command. It is made up of a number of groups and individuals, united by their common debt to the work of René Guénon.” He defines a Traditionalist as a “person forming part of the movement deriving from René Guénon, or of a movement deriving from that movement [emphasis added].”14 The author’s definition of a Traditionalist allows him to create a “List of Main Characters” at the beginning of the book that lists “The Seven Most Important Traditionalists”.15 Many readers will be very surprised to see the names of Julius Evola, Mircea Eliade and Alexander Dugin on this list, because many aspects of each of their writings deviate significantly from the other men’s writings and from the central ideas of the Perennialist School. This is undoubtedly the first time that these three names have been included in a list of the seven most important Traditionalists. The author’s definition of Traditionalism therefore includes not only the Perennialist School, but also three identifiably different points of view under the same umbrella. It therefore becomes, as any moderately discerning reader can tell, hardly possible to identify shared ideas among these so-called “Traditionalists” or to relate the ideas of many of these “Traditionalists” back to the three concepts the author uses to define Traditionalist philosophy.16 Perhaps the confusion in the minds of our readers will be clarified when we apply the author’s ambitious schema to another of his newly coined definitions: political Traditionalism. The chapter of the book entitled, “Neo-Eurasianism in Russia,” is devoted to Alexander Dugin and Russian politics. In this section the author acknowledges that Dugin’s point of view is based upon Evola’s writings, but with several significant departures from Evola. The book states “Dugin’s second modification of [Evola’s interpretation of] Traditionalism was to combine it with a doctrine known as Geopolitics or Eurasianism.”21 The book then elaborates: “Dugin’s Neo-Eurasianism is not specifically or overtly Traditionalist… The word ‘tradition’ does not appear in the glossary of [his books], for example, and no Traditionalist or other philosophical authors are in the extracts from classic texts included in [Dugin’s] book.” Dr. Sedgwick goes on to note that after 2000, Dugin’s “main focus shifted to what he called ‘radical centrism’” and that the other key person in this movement “was not a Traditionalist”. Dr. Sedgwick may be correct when he says that “Traditionalist influences can easily be identified [in Dugin’s point of view] by the informed reader”; however, perhaps that is the most that should be said when attempting to connect Dugin to Guénon. The book’s new definition of a Traditionalist as a “follower of Guénon in one sense or another, ora follower of such a follower” allows the author to trace Dugin back to Evola, and then Evola back to Guénon. The author therefore paints Traditionalism in political terms, as the advertising story lines for the book assert in connecting Traditionalism with “Fascism, Nazism and anti-democratic forces in post-Soviet Russia”. However, as we have seen, this connection is contrary to most existing scholarship and to many of the author’s own admissions. This connection is even more strained because Dr. Sedgwick acknowledges that central elements of Evola’s writings are “recognizably a variation on the established Traditionalist philosophy” and that Dugin is even further away from Guénon’s perspective than Evola. Using similar unsubstantiated and tenuous logic, it would be possible to connect most political events of the last century to any number of philosophers.22 Dr. Sedgwick is the first author to link Traditionalism to these political movements and to coin the term “political Traditionalism”.23 Let us hope that he is also the last to do so, since this alleged link to Traditionalism is sufficiently irrelevant to, and incompatible with, the common core principles identified with this school of thought that it does not merit further discussion. The discussion of political Traditionalism highlights the confusion that results from the different ways that Dr. Sedgwick uses variations on the word “tradition”. First, the author is not consistent in the way he uses his newly coined terminology and he often fails to provide sufficient definition.24 For example, he says, “the ‘tradition’ to which ‘Traditionalism’ refers is, in essence, the perennial religion.” The use of these terms among established Traditionalist authors appears to be substantially different from Dr. Sedgwick’s new definitions. The book also coins the terms “Guénonian Traditionalism” and “Traditionalist Perennialism”, without definition. And, as we have seen in the examination of “political Traditionalism”, many of the so-called “Important Traditionalists” do not subscribe to elements in the book’s definition of Traditionalist philosophy. To say the least then, the line of “political Traditionalists” that leads to Dugin bears no resemblance to the Perennialist School; the author’s definition of Traditionalism is thus so expansive as to include entire movements that do not agree on central ideas. This reviewer concludes that Dr. Sedgwick has attempted to stretch the definition of a Traditionalist in unprecedented and inappropriate ways, 25 while inaccurately narrowing the correct definition of Traditionalist philosophy. Such flaws in the conceptual framework of Dr. Sedgwick’s scholarship cause it to fail by any measure. A large portion of Against the Modern World focuses on conflict among Guénon and several inheritors of his intellectual legacy insofar as these inheritors allegedly challenge Guénon, and then each other, for supremacy within the Traditionalist movement. The book portrays a series of disagreements—apparent schisms—that result in a splintering into distinct groups, and then into distinct sub-groups, all of which apparently disagree with the others. The author summarily disregards their shared beliefs and instead accentuates only their alleged disagreements, all against the background of a list of supposed character flaws of almost every person profiled in the book. At one point Dr. Sedgwick identifies the primary source of what is described as a substantial break between Guénon and one of his followers,28 but in the absence of information about the underlying issues, the reader is left to wonder why this and other differences seem so insurmountable? Because there are almost no references to, or analysis of, the writings or opinions of prominent Traditionalist authors, the uninformed reader is also left to wonder whether key Traditionalists would agree with the book’s assertions. Readers already familiar with Traditionalism will have different questions because they will recognize that the author’s opinions are contrary to the writings of leading Perennialists. The book therefore has many attributes not of a scholarly research work but of a historical novel because of its focus on conflict in personal relationships, its shallow and often confusing presentation of underlying concepts and its failure to present any substantive analysis. In correspondence with Dr. Sedgwick during the review of the manuscript, he acknowledged that he had not read the great majority of the previously published articles and books about Traditionalism cited in this review, many of which contained information contrary to his allegations and conclusions. During February 2003 many deficiencies in the manuscript were identified and an abundance of written material and citations were brought to Dr. Sedgwick’s attention. Initially, Dr. Sedgwick adamantly refused to postpone his impending deadline for submitting the final manuscript to the publisher in order to meet the originally scheduled publication date of September 2003. A collegial process turned into a contentious process when it became evident that he did not willingly intend to take the time to acquire an informed knowledge of Traditionalism before publishing his book.34 The publication date was eventually postponed for nine months, but the changes the author made did not correct the problems that have already been noted. Nor does the author disclose a great deal of information that directly contradicts or tends to undermine his allegations and conclusions. For example, Dr. Sedgwick was provided with extensive and irrefutable documentation, including newspaper articles and court records, which demonstrate that two of his informants are not authoritative sources because they both have intense personal animosity towards members of the Perennialist School; they both have extensive court records that include being judged in “contempt of court” multiple times; one has a criminal record that resulted in psychological counseling; and the other is an adjudicated fraud and perjurer.35 Dr. Sedgwick’s response was: “for a historian, there is really no such thing as ‘an authoritative source’.”36 Unfortunately readers who rely on this book to draw conclusions about Traditionalism are not aware of this background information, since the author never mentions it. 1 These and the other citations in this review demonstrate that Against the Modern World is not the “first history of Traditionalism”. Traditionalism: Religion in the Light of the Perennial Philosophy by Harry Oldmeadow (Sri Lanka Institute of Traditional Studies, 2000); Jean Borella’s essay entitled, “Rene Guénon and the Traditionalist School” in Modern Esoteric Spirituality (Crossroad, l992), edited by Antoine Faivre and Jacob Needleman; The Only Tradition by William W. Quinn Jr. (SUNY, 1997); Forgotten Truth: The Primordial Tradition by Huston Smith (Harper, 1976); Journeys East: 20th Century Western Encounters with Eastern Religious Traditions by Harry Oldmeadow (World Wisdom, 2004). World Wisdom’s “Library of Perennial Philosophy”, together with explanatory materials, can be reviewed at www.worldwisdom.com. 2 E-mail from Mark Sedgwick dated January 23, 2003. 3 The description was posted on the author’s Internet site: www.traditionalists.org. 4 Sufism is Islamic mysticism and a tariqa is one of many Sufi orders that provide guidance to spiritual seekers following a Sufi path. 5 E-mail from Mark Sedgwick dated January 23, 2003. 6 E-mail from Mark Sedgwick dated February 19, 2003. 7 Anyone reading the published material cited in this review should be able to draw their own conclusions on this issue regarding those authors and the details of their private lives. 8 Dr. Sedgwick has justified his opinion with an illustration that is contrary to the Prophet Muhammad’s practice not to fast while traveling during Ramadan. It is predominantly the more fundamentalist Muslims who ignore the recommended simplifications of rites and instead burden themselves with unnecessary hardships. The author’s illustration is therefore of almost entirely fundamentalist origin because it involves travelers during Ramadan who take on unnecessary hardship as a type of penance. 9 The practice of dhikr—prayer of the heart—is the heart of Sufism. This is only one example of many of Dr. Sedgwick’s remarks that denigrate Sufism, a position that is also consistent with almost all Islamic fundamentalist groups. 11 To offer readers a point of contrast, we offer the following abbreviated definitions of selected terms that are consistent with the general understanding and usage of those terms among today’s leading Traditionalist writers. A “perennialist” subscribes to the idea that there is a transcendent Unity of religion from which emanates the timeless Truth underlying the diverse religions, this Truth often being referred to as the Sophia Perennis, Religio Perennis or Philosophia Perennis (Perennial Wisdom, Perennial Religion or Perennial Philosophy respectively). A “traditionalist” subscribes to the proposition that the spiritual tradition of each religion, including the writings of their great sages and their artistic creations, is an indispensable support for the perpetuation of the perennial Truth within each religion. The timeless wisdom of the Perennial Philosophy provides the intellectual principles capable of explaining both the formal contradictions between the religions and the transcendent Unity that is the source of the great religions. 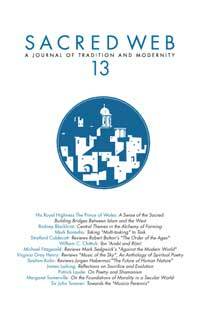 13 The author states, “[Seyyed Hossein] Nasr had convinced me [that this philosophy] should be called not Guénonianism but Traditionalism.” However, one finally has to conclude that the author has misunderstood Dr. Nasr’s comments because Dr. Nasr has written extensively about the definition of Traditionalist philosophy and Traditionalism, and his definitions and explanations do not correspond to Dr. Sedgwick’s revised definitions. It is probable that Dr. Nasr’s comment was meant to insist that Guenon’s writings alone do not constitute an integral shared philosophy, which must include the work of the other central writers of this school. Therefore Dr. Nasr insists that the definition focus on underlying concepts and not on any one individual. For a more extensive explanation, see Dr. Nasr’s chapter, “What is Tradition?” in his Knowledge and the Sacred (SUNY, l989). 15 The seven are (by date of birth): Dr. Ananda Coomaraswamy, René Guénon, Baron Julius Evola, Dr. Mircea Eliade, Frithjof Schuon, Dr. Seyyed Hossein Nasr and Alexander Dugin. The writings of Guénon, Coomaraswamy, Schuon and Nasr contain many shared principles and all four are important writers in the Perennialist School. 16 For purposes of discussion we will assume that Dr. Sedgwick’s understanding of both inversion and initiation are central to Guénon’s thought, and thus, by definition, that they must be included in the Perennialist School. Mircea Eliade’s writings are not concerned either with initiation or inversion. Neither of these two concepts is an important part of Evola’s or Dugin’s writings, although both are critical of various aspects of modernity. 18 The author says: “Evola’s analysis of modernity is recognizably a variation on the established Traditionalist philosophy,” but he fails to elaborate in sufficient detail. 19 For example, Frithjof Schuon was a soldier in the French Army who fought against the Nazis, was captured, escaped from a Nazi prison camp and fled into Switzerland. 20 Dr. Sedgwick does not cite the book entitled, Man Among the Ruins (Inner Traditions, 2002), a compilation of Evola’s writings that contains a well-researched essay by H.T. Hanson on Evola’s thought. In this essay Hanson analyzes the complex figure of Evola and shows that he was a fearless critic of the Fascist regime, asserting the existence of an intellectual elite based upon spiritual and intellectual principles and rejecting the biological racism of the Nazis. 21 “Neo-Eurasianism” is Dugin’s term to describe his political point of view. 22 Regardless of one’s opinion of the traditional principles underlying the Hindu caste system, a parallel application of Dr. Sedgwick’s logic could trace the biological racism of the Nazis to Hinduism, an equally improper link. 23 “Political Traditionalism” is a non sequitur because it is inconsistent with the apolitical nature of Traditionalism, which is focused on a study of the underlying spiritual truths and practices that live at the heart of each religion. The fact that Dr. Sedgwick has coined such a term indicates that he does not understand the foundational principles of Traditionalist thought and that the ambitious scope of his elaborate schema is intrinsically flawed. 24 The book rarely mentions or defines key Traditionalist terms, such as the “transcendent unity of religions”, which are common in Traditionalist writings and could help to define this point of view. 26 For example, he says, “an apocalyptic view of things became one of the most important elements of Traditionalism”, without being able to cite any important Traditionalist author or writing to verify this opinion. If Guénon and other Perennialists were such pessimists, why would they take so much trouble to emphasize the need for prayer and to try to point readers back to their respective religious traditions? This is another example of the author’s uniformly critical and exaggerated observations of Traditionalism. 27 In the Prologue the author states: “mere Fascism had always been far too tame for Evola… Evola was to Mussolini as Trotski was to Stalin—but who has heard of him?” Such generalizations seem exaggerated when Dr. Sedgwick’s later chapters disclose a selection of Evola’s many criticisms of Fascism, including the fact that Evola edited a newspaper column entitled “Spiritual Problems in Fascist Ethics”. 28 There are multiple references to a disagreement over the validity of Christian sacraments, but there is no discussion about the substance of the disagreement or the practical implications to Christians. 29 In the book he refers to his anonymous informants by numbers. 30 As just one example, Dr. Sedgwick’s allegations against Frithjof Schuon are discussed in detail in “Frithjof Schuon: Providence Without Paradox”, Sacred Web 8 (2001). Frithjof Schuon: Life and Teachings,by Jean-Baptiste Aymard and Patrick Laude (SUNY, 2004) contains several English translations of material that has previously only been available in French. 31 Dr. Sedgwick is able to make such accusations with relative impunity because our laws do not protect the dead against libelous and defamatory comments. 32 Those writings include: The Essential Ananda K. Coomaraswamy,edited by Rama Coomaraswamy (World Wisdom, 2004); Dossier H: René Guénon (L’Age d’Homme, 1984); Dossier H: Frithjof Schuon, edited by Jean-Baptiste Aymard and Patrick Laude (L’Age d’Homme, 2001); Fragments of Infinity: Essays in Religion and Philosophy: A Festschrift in Honor of Professor Huston Smith, edited by Arvind Sharma (Prism, 1991); and The Philosophy of Seyyed Hossein Nasr, edited by Lewis E. Hahn, Randall E. Auxier and Lucian W. Stone (Open Court, 2001), which is a volume in the Library of Living Philosophers series. 34 Readers should be aware of the contentious history between this reviewer and the author. 35 The author mentions two “allegations” of misconduct raised by Perennialists, but does not identify the many actual legal judgments against these two informants, including an assessment of punitive damages based on fraud. 36 E-mail from Mark Sedgwick dated January 19, 2003. 37 Cited from Needleman’s Introduction to The Sword of Gnosis (Penguin, 1974). This book is also an authoritative source of information about Traditionalism.